Yesterday night, I revisited a book -, a series of dialogues by David Bohm and J. Krishnamurti entitled "The ending of time". No two men could have been so diametrically opposite in their thinking, vocation and approach to life; but as chance would have it - in the summer of 1965, at Saanen, Switzerland - these two men got together as a part of a group having discussions on life, consciousness and its objective manifestation. It was evident to those who were present there that something phenomenal was taking place , and there was a definitive need to bring the both of them together alone , giving them space and time to unwrap their perspectives on life, knowledge and human condition. Thus was born the JK-Bohm dialogues. Two sharp, incisive, sensitive, deep minds - one, an iconoclastic philosopher ; and the other- a living genius in the field of quantum physics - trying to investigate into human predicament without any prejudices or leanings. It had been twenty years since the second world war had ended, and its aftermath had given birth to radical discontent in Man. Three hundred years of meteoric progress had propelled human civilization to unprecedented mastery of nature, but only losing his inner soul in the process. The culmination of this catastrophe were the two world wars, fought at a scale and magnitude that was unprecedented in recorded history. Not only was Man physically pitted against Man, but ideologies, illusions, religious beliefs, educated untruths converged to create an insane crucible of pain and suffering. And as the century slid along its second half, increasing lack of purpose, direction and a senseless abandonment was taking hold of Man the world over. Organized religion was losing its grip, science was misunderstood, and the general attitude in life was one of deep skepticism. It is in this context, that JK- Bohm dialogues took shape. Over the next twenty years ( until 1985), the two of them regularly met, discussed, struggled to bring about an understanding of truth in the light of modern understanding and existential facts. Three books were published out of those dialogues; and "ending of time" is perhaps the best compendium among them; spanning thirteen conversations that lead the reader through corridors of intellectual rigor and uncompromising pursuit of truth. JK's fundamental experience is that Truth is a pathless land, and one must break with all accumulated traditions, indoctrination and accepted beliefs to "know" oneself, and Dr Bohm's scientific position was that the Nature of reality and consciousness are part of one holistic movement and never static. Both of them were seekers of truth with utmost integrity and respect for each other's viewpoint. As I read these dialogues, my heart swells with gratitude, and eyes become wet. Such Honesty, Such humility and magnanimity in exploring an idea without having to impose or dictate or stamp a particular point of view. Like a rose that unfolds its petals in the wild with sensitive beauty, their perceptions and insights gracefully open up with organic clarity that spreads, seeps through our being like a pristine gurgling stream winding its way in a dense woodland -watering, nourishing and gently chipping away banks of encrusted beliefs and prejudices - leaving behind a path that is ever fresh, ever open to newer riches. 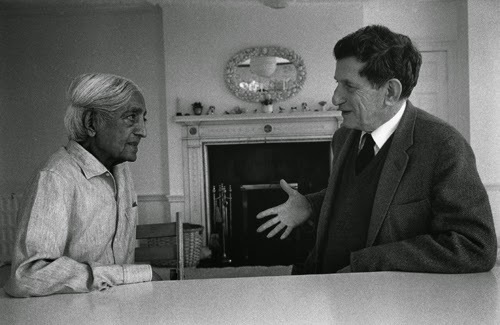 The last dialogue took place in 1984 at Brokwood, England, where Krishnamurti had established a school and Dr Bohm was one its trustees. Recorded videos would show them as white haired, physically aged and faces furrowed with lines; yet their eyes are bright and luminous with realized and radiating intelligence, a conversational freshness that betrays any kind of conclusions reached; but only immersed in the sheer joy of discovering life anew in each moment - in each dialogue. One could viscerally feel that they understand each other deeply, and not just verbally. It was a connect that was beyond words. A look of recognition, a quick smile, a gentle nod - all of them pointed to a confluence of two of the greatest thinkers of our era. Jk passed away in 1987, and Dr Bohm in 1992. Not much to separate them. They were bought together for a special purpose, and life had consummated its task. Over two thousand years ago, Plato initiated Western civilization to dialogues as a medium to understand deeper truths; and even before that the Indian tradition of Upanishads dealt with the subtlest of truths as an intimate conversation between people deeply interested in enquiry. JK- Bohm dialogues continued that austere tradition in the most refreshing way possible..
Read, or see them if you can. It can be a transforming experience. Nicely captured. JK's views are always fresh and always consistent. I recall reading the same book -it was in 2010 I think - at Rajghat, Varanasi - one of JK's schools. The mutual respect and the way the conversations unfolded - were as you had written. The other JK book I return to often is "Freedom from the known" , apparently the most concise work of his philosophy authorised by him, and put together by Mary Lutyens I think.